Apologies to any regular readers of my blog, especially those who are trying to follow the PP08 training programme along with us, for the lack of updates this week. A quick roundup of the week follows. To plan, but I started the week feeling tired, lethargic, and lacking motivation. Doesn’t work too well as I cropped the right hand side off with the red HR scale, but the 25mph line on the left is also 180bpm, and 20mph = 160bpm. The race section is obvious from the HR trace, and you can see I started at 15mph, slowed as the gradient increased, then sprinted the finish from the hairpin. I came 4th overall, beating 3 cycling club guys, which was good. Only 7 entrants as it was pretty wet, which I’m sure put many of the non hardened cyclists off. Wednesday was one I was really looking forward to, a 10mile TT on the A31 between Bentley and Alton. This was to be my benchmark time trial before doing much in the way of bike training, and I was confident of a good time. As it was the weather was bad – wet and windy, but I warmed up, and set off strongly. After 1.5miles though I got a puncture in my front wheel, and the tyre was completely flat. I didn’t want to wreck my wheel riding on a flat tyre, I didn’t want to wreck my new cycling shoes walking in the. So all that was left was to take the shoes off, and push the bike the 1.5miles back down the dual carriageway. It was raining, I was in my socks, it was miserable. It really showed the benefits of exercising indoors. Thursday I was busy at work, and still annoyed about the walk the night before, and didn’t train. 3 days off the erg isn’t good – without solid training I don’t sleep well. If I don’t sleep well I don’t want to train. Again session achieved pretty much on target depite really not having my head in the training. I’m sure the weather forecast was bad for this weekend. I expected a wet day’s racing in Reading yesterday, and no chance to get outside for any exercise today. But after a couple of hours watching the Olympics, and getting motivated by the track cycling to want to go out for a ride, I donned my cycing shoes for the second time and went out for a quick 30min spin. A 22.7mph average for that middle 5.4mile section, which felt good. For the first time I felt confident on the bike, and much more stable even when pushing the speed a little. It’s a shame the traffic and roadworks are bad through town at the moment, as I was nicely warmed up into it by then, and could have pushed on at the fast pace for a good bit longer. An enjoyable short ride anyway. Today was the “cross training meets duathlon” event in Reading. I arrived over at Palmer Park in Reading at 1215 hoping to see the main heat of the rowathlon, but unfortunately they had already finished. I was surprised that Team Oarsome’s Simon Gough had only managed 5th place in that, thinking he would be up there with the best. All became clear when the results sheet was posted though stating the times for the 14 bike laps – Si thought it was 17 laps, so have ridden 17 laps – I believe they are 500m laps, so the extra 1.5km almost certainly cost him a top 10 finish. On to the cross training event. Entries were quite high so it was split into 2 heats. This would good as I could gauge from the first one whether my tactical plan was the best one. One guy went off hard in the 800m, rowed the first 2k well, did the 50 press ups straight off, started to suffer on the squat thrusts, then blow worse then I’ve ever seen someone blow on an erg 2k, ever. He took 3 breaks of about 20seconds a time with the handle down during the 2k, and even on rowing time it took 8min15. Pacing the first half was definitely the key. There were strong competitors in the second heat – James Hart one of the top rowathletes, Warren Matthews of Sub7, and Chris Friend from Leander club. Off the line in the 800m I just positioned myself in the middle of the pack, and stayed about 10 to 15m off the fastest guy for the first lap. It felt good, no idea how fast we were running, but I enjoyed it. It was pretty windy down the home straight, so I ran behind Warren to conserve a little energy. Second lap was good, kept around 15m behind the top guys, and onto the rowers. I set off with a plan of rowing this one at 1:45’s flat to be nice and comfortable, which went perfectly to plan. I was a little faster than the others, and came off the rower first for the 30m run down to the press up / squat thrust area. This is where is started to go wrong. The guy I thought was supposed to counting for me said he was counting for someone else – it took 20seconds or so of standing there and most of the field catching back up for Will Whitmore to offer to count for me. The press ups were as expected, hard. I did 25 first off, then I think 10 more, then in 4’s or so to the end, not too bad. Will switched with Lee Rankin who then counted the squat thrusts. Now I practiced these in the gym, and they were fine. I don’t know what I did wrong today, but they were impossible? I had to rest 3 or 4 times during the 50, and ended up coming off there in near last place! Lee was great with motivation during them though, and helped me get through. I suspect I started with my hands too close to the line, and so too compressed in the lower body. Then it was the 30m jog back down to the ergs, and I was a good minute or so behind James and Warren. This time I wanted to conserve energy again and recover for the run, so just rowed the second 2k at 1:49 / 1:50 – I was surprised that James rowed at the same pace through this 2k, he’s a quality athlete considering he is older and smaller than me, and his 2k pb is only mid 6:30’s. When James left the erg I still had over 300m to go. I got out just after Warren, and just before Chris from Leander. The first lap of the run was pretty tough, Chris went past me and put me in 5th. Then I recovered enough over that first lap to pretty much maintain the gap for the remainder of the 800m. It seemed like I was a long way off the best in the race, but 1min10 over that duration I guess isn’t that much, so without the 20sec wait for a counter, and if I could actually do press up and squat thrusts, it would have been a bit closer. Great race by James after doing the rowathlon in the morning, and quality performances by Warren, Chris and the others. I think I’m more like to do the rowathlon race next year in order to avoid the press ups and squat thrusts! Great atmosphere though, and a very well run event. As you can see, at half way I made the decision that today wasn’t the day to put it on the line and push on for the pb. After 1k much slower I did row strongly again in the final 2k though, making it a good solid training session. The first 3k at pace felt pretty good, and gave me extra confidence for the 5k test coming up in 2 weeks time. I decided to get some SPD pedals and shoes for my road bike. The shoes arrived a couple of days ago, and the pedals today. As I’ve never used proper cycling shoes before I thought I’d try them out on the turbo bike first. After wrecking one spanner trying to get the pedals off there I gave up and put them straight on my outdoor bike instead. Average speed for the 7 miles was 19.1mph, and that’s pretty good considering I started slowly, never pushed very hard, and my heart rate stayed below 150 for all but the final slope up. Also a good portion of riding well above 20mph in the second half. It would be interesting to try a time trial at this early stage of my cycle training as a baseline – don’t tell anyone, but I might just do that as there is a 10mile TT next week not too far away…. Just over 2 weeks to go before the 5k now, so the harder sessions have to be good quality and at pace. Back down on the rep distance today to 1400m, and so an opportunity to increase the pace a little. Solid session, not really seeing any 1:40 splits throughout each rep, which is a good sign. What does this all mean for the 5k test on 29th August though, and how do the paces I’m doing on these session compare to the plan for that? Although I’ve said through this phase that I’m training at 5k pace, and for example that the 6 x 1k is a good pace predictor for me for the 5k, I don’t like to row a 5k on flat splits. What is more likely is that the pace I end up at on the intervals sessions in 2 weeks time I will step back 0.5 to 1second in pace for the “base pace” for the 5k. What this means is that I will row the bulk for the middle section of the 5k at this base pace, as being slightly slower than the pace I have become efficient at rowing at through the interval training it will feel slightly (very slightly) in the comfort zone. This is the way I have successful rowed race and time trial 5k’s in the past. Effectively what I would do if I was doing the 5k at the end of the this week would be to go off hard for 5 strokes, settle over the next 5 strokes down to 1:38 or so, and slowly back off to around 1:39.5 – 1:40.0 on the instantaneous split (ie seeing 1:40’s and some 1:39’s). Then I would hold this until the end is in sight, which for me on a 5k is at 2k remaining, as you can then treat it like a single 2k piece. From that point on I would try to see only 1:39’s, and gradually bringing the pace down into the final 1k, and building as much as possible from 500m out. Ideally this would sit me around 1:39 average at 500m in, slowing to perhaps 1:39.5 – 1:39.7 by 2k to go, and then slowing lowing back down through my pb split of 1:39.3, and with the final sprint down to 1:38.9. That would be the plan, anyway. The next two weeks of interval sessions will tell me whether this base pace can be any faster, but I think this plan will certainly get me a pb currently. 800m run on the track – hopefully around 3mins as long as adrenelin doesn’t try to make me keep up with the fast runners. 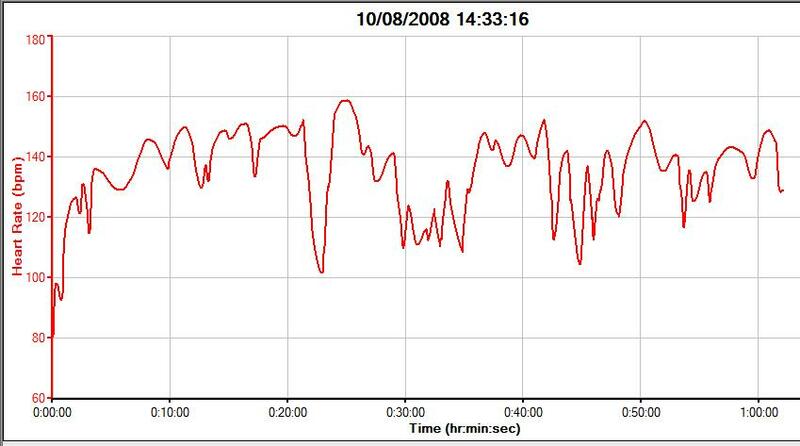 2k erg – somewhere around 6:55, give or take 5seconds, I think will be a good comfortable pace, as I don’t want to take any fatigue into the press ups. 50 press ups – I’m not great at these. I will try to do at least 25 in the first set, then pick them off with short rests as best I can. Hopefully get the 50 in under 2mins – I hope adrenelin will help here. 50 squat thrusts – I don’t ‘think’ I will have any problem with these, so should reel them off in a minute or under. 2k erg – this one will depend a little on the competition, and whether I think I’m in with any shout of top 3. Again through I think around 6:55 give or take 5 seconds will leave me fresh enough for the run. 800m run – this solely depends on where I am in the field (of which I have no idea how many there are), as position will be the important thing. Take it easy for a lap if possible, then get the best position possible. Hopefully under 3mins. As that is half way between 5k and 10k erg duration that tells me that my paces for the run and row might be a little conservative. When I’ve done this type of thing in the gym before (quite a few years ago) I generally went with the idea that each component could certainly be done at the pace you would do that one activity for the duration of the whole event. So that would make the rowing more like 1:42 pace rather than 1:45, but the 12seconds that would gain me over a 2k I think would be more than lost on the press ups, and the second half of the row and run, so I will stick to my plan above. Wish me luck, and hope for a dry hour on Saturday afternoon! Nice and easy – slightly lower rate than normal simply because another rower at the gym was doing a distance piece at 22spm, and when you fit in with someone elses rate you don’t have to think about what you’re doing at all. Tomorrow on to the 4 x 1400m / 4min rest with a target of 1:39.0. I won’t say definitely that this is the toughest session we’ll be doing during this 5k phase of PP08, as when I said that during the 10k training phase some of the athletes following the plan seemed to have a different idea when the following week’s schedule was released. However, today’s session is a tough one. The aim was to keep all reps under 1:39.3, my 5k pb pace, so it was a successful session. Without looking back through my old training diaries I can’t quantify how much faster this is than previous attempts when working up towards a 5k test, but I am certain it is the fastest I’ve completed the session ever. With nearly 3 weeks to go before the end of phase 5k test things are looking good at the moment. When I finished this session at lunchtime today it made me wonder whether I should do a 6k test too, as I would like to break the illusive 20mins (1:40.0 pace). My best time for 6k is 20:04, and I’m in better shape physically now. However, the best decision is to stick to the plan, do the 5k around 29th August, and if that goes to plan perhaps go for the 6k a week or two later, during the initial stages of BIRC training. The 5k test will be the third test of the PP08 programme (4th if you count the marathon I began with). For the first test (half marathon) Jef and I rowed together in my back garden, and Jamie joined us via rowpro from New York. For the second test (10k) David and I rowed it together in his back garden. Does anyone on the PP08 programme want to get together for the 5k? I am happy to host in my back garden again – send me an email if you’re interested. The PP08 programme has been aiming towards the British Indoor Rowing Championships in late October, but not all of the training group will be able to compete there. We will then carry on through to the World Indoor Rowing Championships in February (Boston, USA) where a number of us plan to attend. Medal hopes at this level of competition depend solely, for me, on who shows up to race. I am not fast enough to trouble the best in my category, I’m simply not physically big enough to. So my sole aim is to row the fastest 2k I can at each competition. I would like to row under 6:10 at one of them, but training approaching that time will tell if that is possible. Following that I don’t know what my longer term goals will be. Will there be a PP09? Will I try my hand at some cycling time trialling? Will I have a go at the rowathlon series next year? I’ll just see what my motivation levels are like for each discipline come that time. Target = no rep slower than 5k pb pace, 1:39.3. I watched some of the women’s road race (cycling) on the olympics this morning. The conditions were awful, and there were a number of crashes. I don’t think I’d ever want to ride in a road race with all those bikes about as one person’s mistake causes a lot of people to go down. I’d also not fancy riding at any speed in that much rain, with that much standing water. However, it was enough to motivate me to go out for another ride this afternoon on my bike. I decided to do the ride I had planned to do yesterday morning, and just accept the strong wind, and the slow pace, on the way out. It’s quite difficult on the bike to keep a constant HR when you have wind, gradient, roundabouts, traffic lights, and traffic to deal with. It was a struggle again going out into the wind, over the hill and through Farnham. On the way back heading north along the A325 it felt great though up to 29mph in sections, and cruising along at 25mph for a good distance. I don’t ride in an aero position at all, my body just isn’t used to it, but I’ll get there over time. Consequently when the wind is against me it slows me down a lot, and when it’s to the side of me I have to fight to stay straight – maybe that’s why all good cyclists have such a small upper body, so they don’t act like a sail. One thing that will hopefully help my bike speed is proper clip in pedals and shoes, so I ordered some this morning from wiggle – I look forward to trying them out when they arrive. Another good hour of aerobic exercise is never a bad thing, and I’m sure every mile on the bike helps me improve just a little. I can’t wait for a non windy day though! 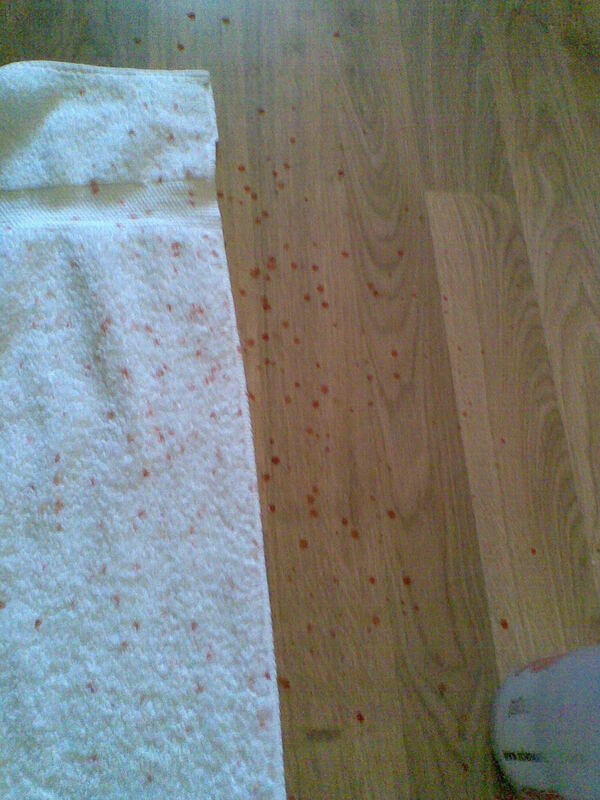 I was a little worried where this sprinkling of blood had come from. If you’ve ever had a blood injury when playing sport you’ll know that when blood mixes with sweat it spreads a long way. Then I remembered, I cut my finger on a broken glass this morning – I’ll spare you the photo of my finger. Also this morning, before the rain came, about 12miles out on my bike.